Okay, confession time! 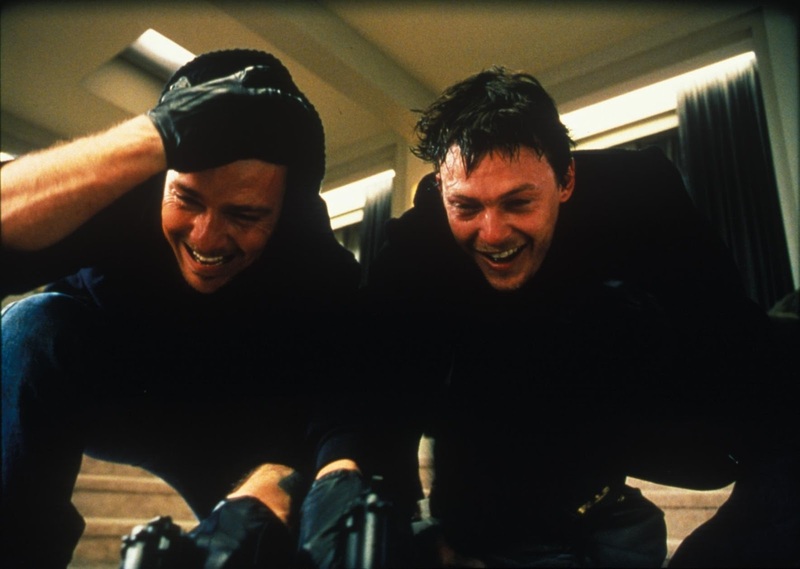 I really really really love Boondock Saints, the ultra-violent, only slightly plotted, female-character devoid, foul-mouthed low-budget action fantasy that came out about fifteen years ago. I mean, I really love it. So much. I first saw it when I was sixteen, and it blew me away. 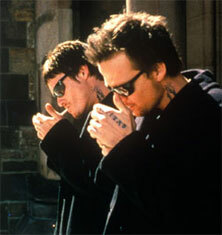 For those of you who didn’t pretty much watch this on repeat in college (it was oddly popular at the time), Boondock Saints is a shoot-em-up fairytale, about a pair of Irish twins (Norman Reedus and Sean Patrick Flanery) who get a calling from God to kill every gangster and general criminal in Boston. They are pursued by an unusual FBI agent (Willem Defoe, in arguably his best role ever), who can’t decide if he agrees with them or not. Oh, and they have a friend named Rocco, who is literally there because he was the director’s best friend and is an okay addition to the story but the worst ever addition to the already terrible sequel. Seriously. Don’t watch the sequel. Learn from my bad life choices. Just say no. Oh, and Billy Connolly plays a fellow hitman, aka their (SPOILER ALERT FOR A FIFTEEN YEAR OLD MOVIE) father. It’s weird, it’s profane, it’s violent, and I love it. Oh, and it has violence against cats (accidental). Probably shouldn’t watch it if you’re at all sensitive to, well, anything. I don’t plan on just talking about how much I like this movie, however. Because while I do like it (a lot), I also have a deep and meaningful problem with the film. Namely, that it’s wrong. About everything. The crux of the movie is that Murphy and Connor, good Irish boys who call their mother and work in a meat-packing plant, get arrested on St. Patrick’s Day for beating up some Russian mobsters. Those mobsters came to them for payback, and the boys killed them (in very creative ways that included a toilet and a high rooftop). They spend a night in jail and are released on self-defense, but before they go, they get a mission from God. Anyway, after this, they find out that they can take out some Russian mobsters, and the whole story goes from there. That’s the important thing, though. They believe that God told them to do this, and that by doing it, they are doing it in his name. And that is so incredibly wrong. I don’t mean to turn this into a big political or religious debate, but it’s pretty clear-cut in the New Testament that God isn’t really into the vengeance business anymore. When Peter tries to defend his God from arrest and death, said God (Jesus), tells him to put away his sword. Because the thing we’re supposed to understand now is that no one soul is more important than another. Okay, that’s a little deep, so I’m going to unpack it. (And then I’ll explain what the heck it has to do with this movie, don’t worry!). In the Old Testament, God was all about the smiting. That’s pretty clear. He had laws, and those who did not follow the laws were fair game. However, in the New Testament, it’s a totally different story. The laws are abolished, and the only laws left are simple. Love the Lord your God with all your heart, mind and soul, and love your neighbor as yourself. Christianity is a proselytizing religion. By that I mean that it is a religion founded on the importance of converting other people to itself. We’re told on and on throughout the NT that the whole point of this is to bring everyone and their sister closer to God, so that they may stand in full communion with him. Which is nice, right? Well, the part where it gets uncomfortable for most of us is when the Bible makes it excruciatingly clear that we don’t get to pick whom we tell the good news to. At all. Ever. That’s literally the whole point of the story of Jonah. It doesn’t matter if the people in question are baby-eating Nickelback fans, we are to share it with them. Which means something very radical: we don’t get to prioritize one life over another. If you truly believe the gospel (which it’s debatable that the boys in Boondock Saints do, but bear with me), then you have no Biblical foundation for condemning the wicked to protect the innocent. In fact, you have a duty and obligation to pursue the hearts of the wicked. And, furthermore, killing them before they have a chance to repent is literally the worst thing you can do to them. Yes, Jesus did ask his followers to “flow a river forth to Thee, and teeming with souls shall it ever be.” But I am absolutely positive that he did not intend there to be murder. 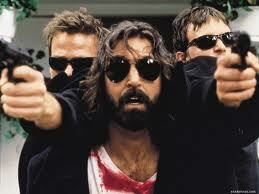 I understand that Boondock Saints isn’t a high-minded religious movie, or a documentary. It’s a piece of silly masculine fantasy, and it’s very enjoyable. I get that I might be “over-reacting”. But, I don’t think I am. This is something very important to me. It’s my faith, and it’s my Bible that they’re bastardizing. Really, what they’re doing is worse. They are deliberately misinterpreting the Gospels and misleading their audience. Killing evil people is the easy answer. Loving them is the right one. So while I can watch Boondock Saints and enjoy it, I just want you to know that there is no scriptural basis for that crap. None. At all. And the idea that there might be is genuinely offensive. And the sequel is terrible.